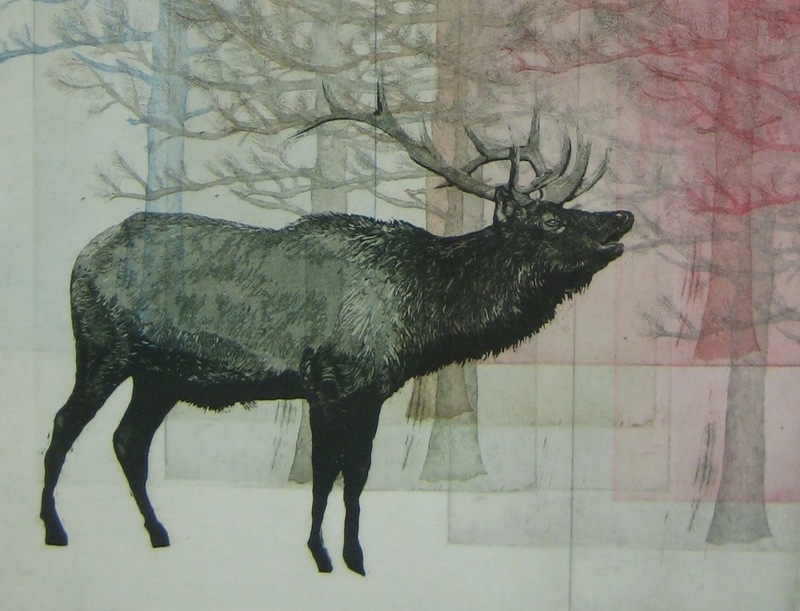 Julia Lucey - Intaglio is a printing method in which ink is forced from recessed areas on a surface onto damp paper by putting it through an etching press. My prints are created mostly by hardground etching and aquatint.The lines of my images are created by a hardground etching. This is done by coating a copper plate with hardground, which is acid resistant. I then draw with a needle to remove the hardground where I want my printed lines to be. After I have finished my drawing, I submerge the copper plate in acid. The acid bites my drawing into the plate, creating a recessed area to hold ink. The longer the plate is in the acid, the more ink the lines will hold, and the darker the image. To create different values over a larger surface area I use a process called Aquatint. The first step in aquatint is applying a powdered rosin to the plate. This creates a dot pattern for the acid to bite, allowing ink to be held within the plate. The rosin is then fused to the plate with heat. After the rosin is fused different values can be created on the plate by putting the plate into the acid. Working from light to dark, the plate is put into the acid and then removed to stop out each level of value with the acid resistant hardground. After I have finished etching my plate I can print it. This is done by first applying ink across the plate, pushing it into my etched areas. I then wipe off excess ink using a tarlatan cloth. After most of the surface ink is wiped off, I hand wipe the plate using the palm of my hand to remove any more excess ink. The plate is then placed face up on an etching press, a damp sheet of etching paper (after having been soaked in a water tub and then blotted) is placed on top. Wool blankets are put over the plate and paper and then I pull the print through the press. Intaglio is a printing method in which ink is forced from recessed areas on a surface onto damp paper by putting it through an etching press. My prints are created mostly by hardground etching and aquatint.The lines of my images are created by a hardground etching. This is done by coating a copper plate with hardground, which is acid resistant. I then draw with a needle to remove the hardground where I want my printed lines to be. After I have finished my drawing, I submerge the copper plate in acid. The acid bites my drawing into the plate, creating a recessed area to hold ink. The longer the plate is in the acid, the more ink the lines will hold, and the darker the image. To create different values over a larger surface area I use a process called Aquatint. The first step in aquatint is applying a powdered rosin to the plate. This creates a dot pattern for the acid to bite, allowing ink to be held within the plate. The rosin is then fused to the plate with heat. After the rosin is fused different values can be created on the plate by putting the plate into the acid. Working from light to dark, the plate is put into the acid and then removed to stop out each level of value with the acid resistant hardground. After I have finished etching my plate I can print it. This is done by first applying ink across the plate, pushing it into my etched areas. I then wipe off excess ink using a tarlatan cloth. After most of the surface ink is wiped off, I hand wipe the plate using the palm of my hand to remove any more excess ink. The plate is then placed face up on an etching press, a damp sheet of etching paper (after having been soaked in a water tub and then blotted) is placed on top. Wool blankets are put over the plate and paper and then I pull the print through the press. Much of my new work, 2017 onward, has been creating collages on panel with my etchings. Below explains how an etching is made, but the follwing page, Etching Collage Process, explains how I use my etchings to make my new work. Prints are made using a variety of processes, some examples are etching, engraving, woodblock, linocuts, collagraph, silkscreen, letterpress, lithography, but generally, a print was created by a printmaker, who hand-created a matrix of some sort to hand print from. Because of this, each print is a little different (no matter how hard the artist tries to make them the same in an edition), they are handmade, and thus, not perfect. They are all original pieces of art, and even if numbered in an edition, are one-of-a-kind. There are three steps that I use to create my etching plates and print them. These are hardground (for line work), aquatint (for creating areas with different gray tones), and then last, printing. The idea of etching is that you create “grooves” or recessed marks in a flat metal plate using acid (I use copper, but zinc and other metals can be used as well). Ink is rubbed into the “grooves” and then using an etching press, pushed into damp paper. The first step I use in creating my plates is using a substance called “hardground.” Hardground is a liquid that dries pretty fast (There are other solid forms, but I like the liquid). It resists acid. I coat my plate in the ground. I then use an etching needle to draw in my line work. I tend to outline my composition and create small line details in this process. I have to remember that etchings will print in reverse, so the way I draw it, will actually be backwards. The brown coating is the hardground. The black circles are sharpie that I can draw in a specific pattern. The scraped areas will etch. After I draw in my image, the plate is put into a bath of acid. The areas I scraped through the hard ground will be eaten away by the acid. The longer I let the acid “bite” the lines, the darker they will will print. I can also manipulate how light or dark my lines will print. At any point, I can pull my plate out and “stop out” or apply hard ground to areas I might want to be lighter and then put the plate back into the acid to “bite” other areas deeper. The plate with the linework finished. After my lines are etched, I wash off the hardground, de-grease the plate and begin the aquatint process. The reason for aquatint is to create large areas with the same gray tone. With a thin line, the ink will “hold” in the plate to print. If you wanted a large area to be solid black, you can’t just expose a large area of plate and let the acid bite it. When you went to wipe ink into the plate, the ink would wipe away, and you would end up with a white area. Aquatint creates a “tooth” or a “dot pattern” to hold the ink. A little illustration of what the cross section of an etched copper plate would look like. Aquatint can be used to create many different effects on the plate, but I like to use it to create a “painterly” line. It is my favorite part of the etching process. Most of my plates are primarily aquatint. Some of my animal plates are only aquatint. The way you create a dot pattern is by putting a fine layer of ground pine rosin onto the surface of the plate. The rosin is melted and bound to the surface of the plate. If the rosin is applied correctly, small areas of copper will be exposed between each grain. Melting rosin onto the plate for aquatint. The box behind the plate has a crank in the bottom that throws the rosin up. The plate is placed in the box as it starts to drift down. The rosin will become clear when it is melted. The pine rosin is acid resistant, so it acts like the hard ground, but in tiny droplets. Now, using the same concept of the hard ground line etching, I can create light and dark areas. I use the hard ground like paint. First I paint my white areas. Painting in the white areas with hardground. I then submerge the plate into the acid bath. I take the plate out after a few minutes of “biting.” Now I will paint out the lightest gray areas with the hard ground. Again, into the acid bath the plate goes, to bite a few minutes more. I paint out the next level gray tone, then into the acid and so forth until I reach the areas I want to be black. I usually “stop out” with hardground eight or nine times before I get to black. I then wash off my plate and it is time to print. Another layer of hardground. This is probably the plates 3rd layer and 3rd grey tone area. Printing is always a surprise. As much as I would like to think I am in control of the etching process, I never really know how the plate will come out. There are many variables in etching. It is chemistry and things like temperature and acid strength (I work in a communal space, so I never know how many times the acid was used by others since my last use) effect the image. Some times there are “greasy” areas where the hardground or rosin did not stick. Printing is like opening a present. I never know what I am going to get, but I am usually pretty happy. For this floral pattern plate I wanted to add a second plate to print on top. I transferred the image by printing the image, and then running the printed paper over a plate coated in hardground. I then drew in a line etching. The plate on the right is the etched plate. The plate on the left has had the etching image registered and transferred onto it, on top of a layer of hardground. I draw into the second plate to create an overlay for the first plate. The two plates printed in different colors. The front green image shows the first Narrowleaf Onion plate. The black line pattern on top was etched into the second plate. The second plate on this image was not aquatinted. In printing, even though I have referred to the process with the ideas of “gray tones,” you can use any color to print. Etching ink is an oil based ink, that like paint, comes in many colors that can be mixed. Etching inks are semi-translucent, that is why the deeper the etched area, the darker the area, as less light can pass through a heavy line of ink. When printing an etching, the first step is to put a thin coat of ink on the plate with a “squeegie” or cardboard chip. Next the plate is wiped with a “cheesecloth” like rag called tarlatan. Wiping the bear plate with tarlatan to distribute ink into the etched area. Excess ink is then hand wiped off the plate. Next the plate is put on an etching press. The second of the two plates used to create the California Fuchsia on the press after being printed. Both plates in this image have had both hardground linework and aquatint.